- and the second [QA3] which used 6 new designs (2672-77). The associated generic Smilers sheets were also with conventional perforations. 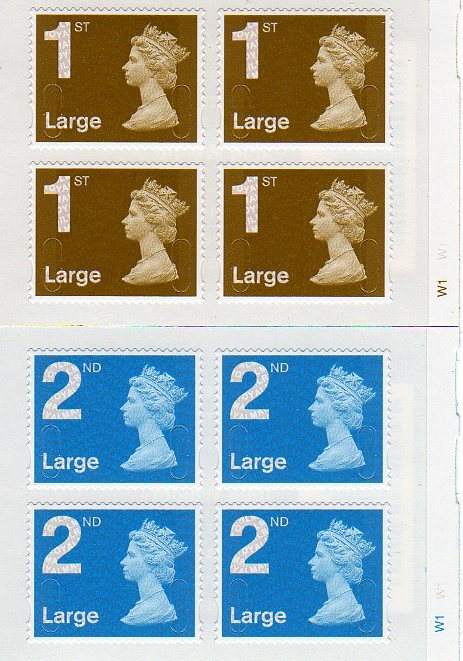 The third booklet [QA4] contained 'the most popular of the first 12' but this time with elliptical perforations, bringing 6 collectably new stamps (2819-24). The two Love booklets [SA1 & SA2] also brought new stamps (2693). 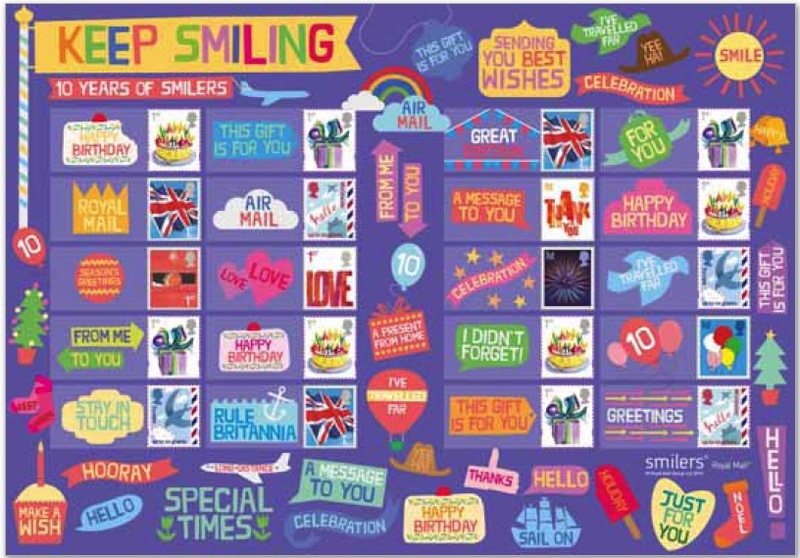 The Smilers for Kids marketing exercise (which thankfully hasn't been repeated in 2010) included the 'New Baby' stamp with elliptical perforations, but as this is only available in the premium-priced sheets it doesn't achieve a separate catalogue listing. 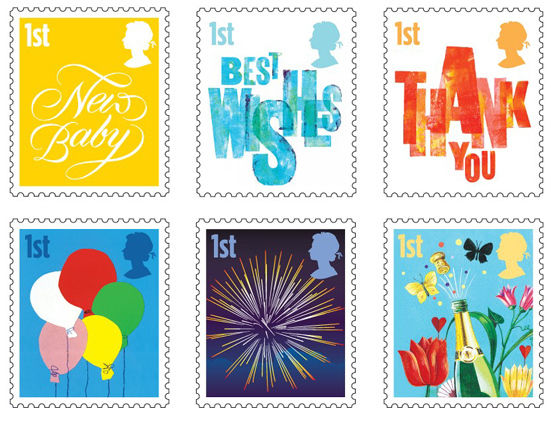 The other three designs in the S4K series (Flower, Hello & Balloons) had all been in QA4 so do have separate listing. 1 each of the Robin, Love, Thank You, Fireworks, and Balloons stamps. All these are litho with elliptical perforations, so the Robin, Fireworks and Thank You are new, not having been included in the 'most popular' QA4 booklet. But these shouldn't be getting a separate catalogue listing either, so make sure you get yours now from this high face value sheet. If you don't get them now, they will be even more expensive when the preprinted albums are published in May 2011 and these are no longer available. * These are counted as 'Visible change' items and Royal Mail standing order customers should get them automatically, unlike the booklets containing new stamps with a visible year code which, are not regarded by Royal Mail as a visible change, because they concern the Security features - as if that makes them any less visible! A correspondent reports the 1st class gold counter sheet (no source code) has now appeared with security code MA10, and a printing date of 10/03/10. It appears that these have been in stock for 2weeks. As BM has pointed out "The security slits on this new printing now have nicks in the top and the bottom of the slit. This brings them into line with Walsall booklet printings." But look around now for the 2nd class! I still haven't received an example of the Gold Label from Wales, but the rest of the United Kingdom is catching up fast. Label used from Bassett Avenue sub-PO Bicester. 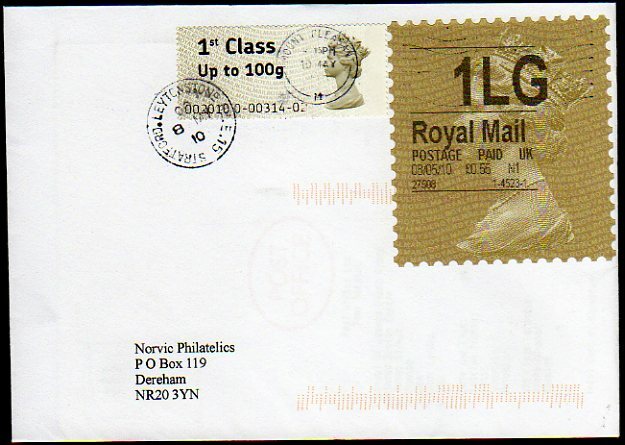 With no phosphor bands it was not machineable in the normal sense but still received a poor 'Thames Valley MC' machine postmark on 11 May 2010, and a census-diamond - all examples seen are like this to some extent. 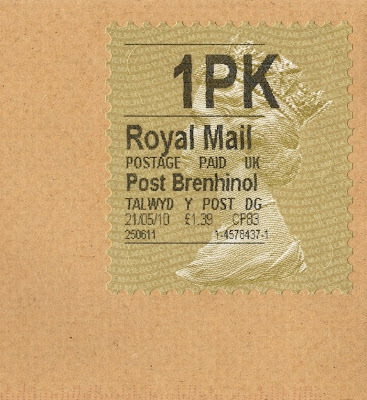 Packet Label from Senghenydd, Wales, image kindly supplied by Kevin B. 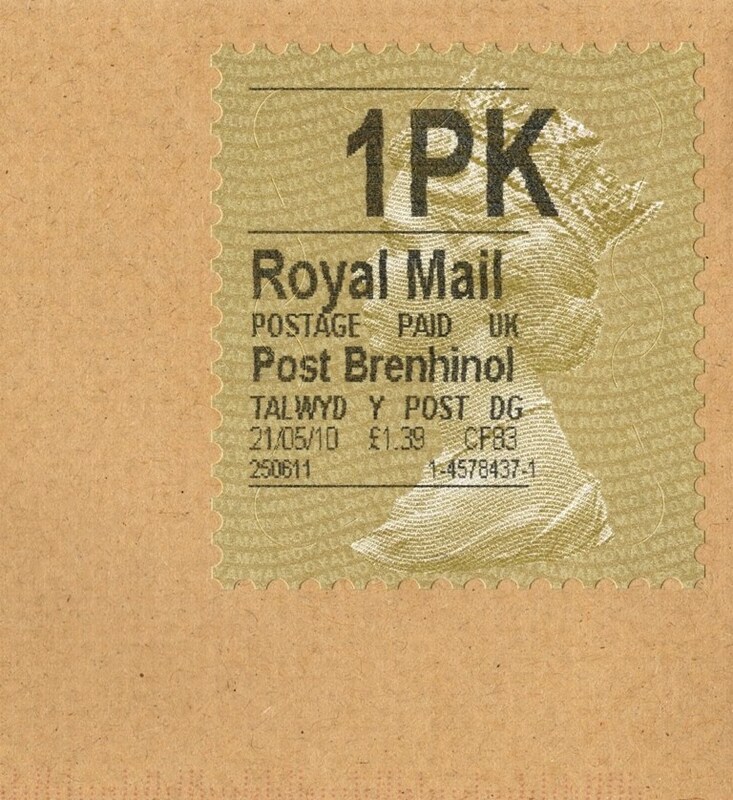 This is one of the actual gold horizon labels I posted to myself from the London Festival of Stamps post office. 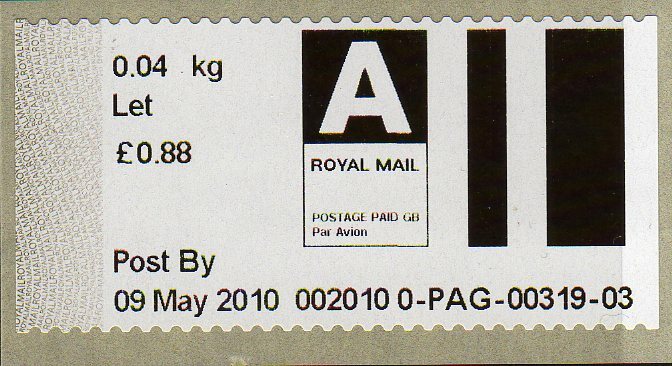 It is not possible to produce Horizon labels for normal letter postage (less than 100gr, ie 41p 1st & 32p 2nd class), so the £0.81 label shown above is the minimum solo use. 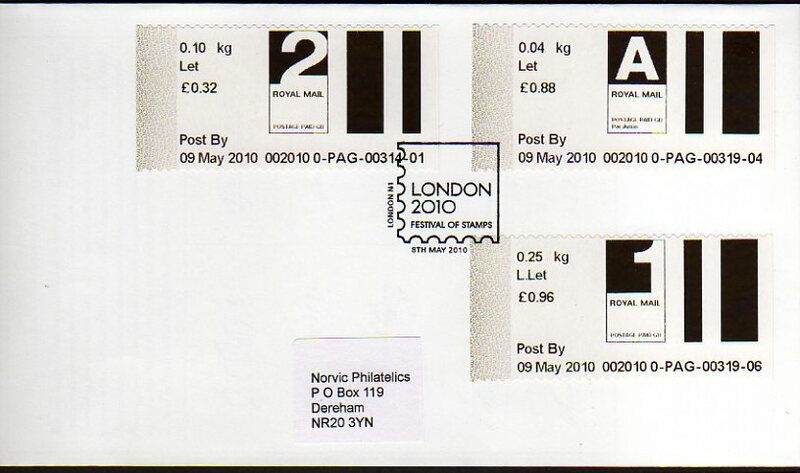 However, you can use Horizon labels to make up the postage on letters also bearing stamps. 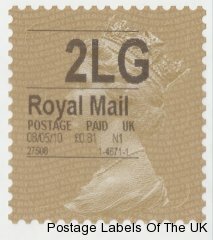 So I produced this novelty item using a Faststamp from the Post & Go machine for the basic 41p, with the balance of 56p on the Horizon label to make the 1st class Large Letter rate. Note that, in accordance with the rules, the Fastamp is handstamped at the counter (in this case the PO service at the show was provided by the postmaster from Leytonstone, so these have the branch CDS). 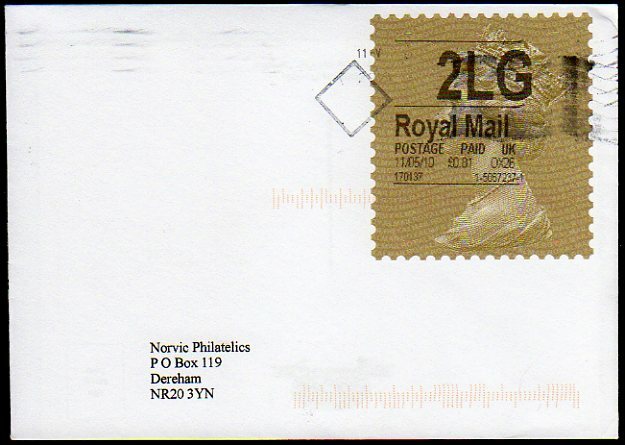 Normally mail posted with Horizon labels would not get a machine postmark as most are non-machineable but this went through the Mount Pleasant machine on the first operational day after the mail was collected from the show at 5.30pm on Saturday 8 May. 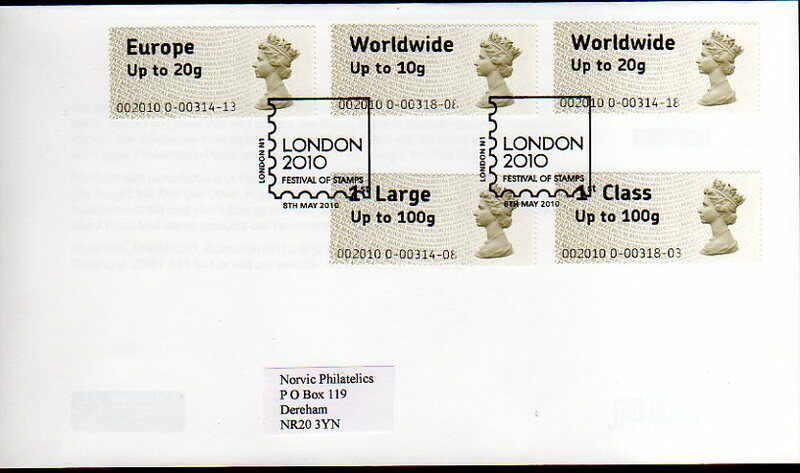 Set of 5 Faststamps from London 2010 Post & Go machine (branch code 002010) cancelled with special show handstamp. 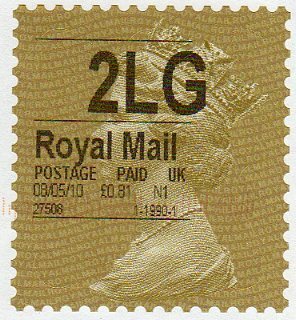 And a set of 3 Post & Go labels from London 2010 Post & Go machine (branch code 002010) cancelled with special show handstamp. These would not normally be cancelled in normal postal operations, but an exception was made for items posted at the show. Machin MPIL variations - accidental or deliberate? The George V prestige stamp book predictably contains a Machin pane which, predictably brought us some new stamps. 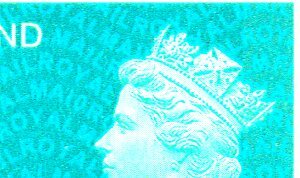 This is a scan of the actual pane, containing 2nd & 1st class stamps, and a 50p, the first self-adhesive PSB pane with small Machin definitives. Of course these have security features, so the source code, at top right is MPIL and the year code, to the left of the eye, is MA10. So far so good. 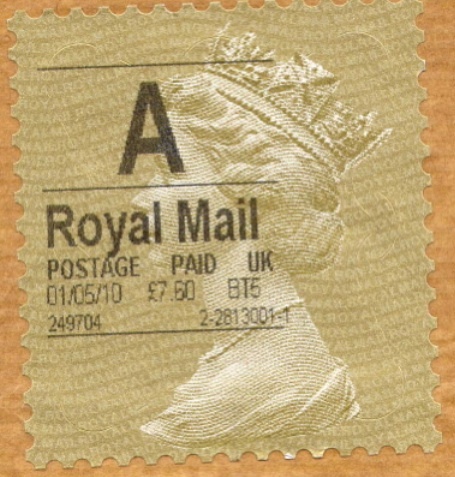 Collectors of Smilers Sheets - especially collectors who have used these stamps on FDCs, know that at an early stage either the printers or Royal Mail's production department recognised that there was a chance that in use the labels could become detatched from the stamp, thus destroying the link and purpose of the personalised stamps. So these sheets included 'hangers' - interrupted die-cut perforations which were designed to keep the label and stamp together. This is an enlarged image from the 2003 Christmas Robins sheet. 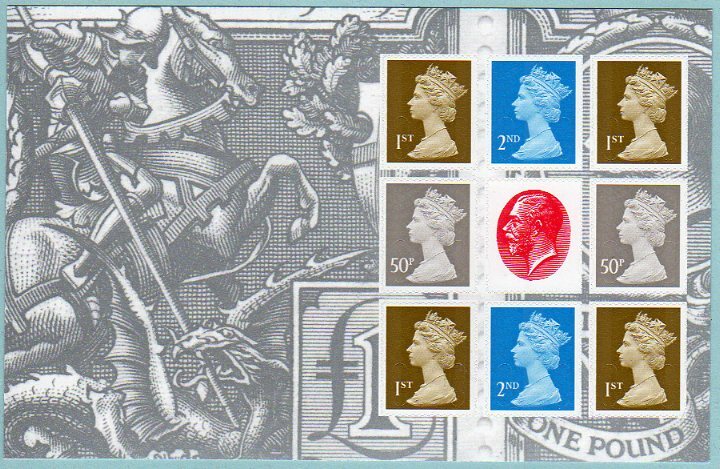 It was no suprise, then, that the same features exist in this PSB pane - after all, Royal Mail standard PSB FDCs always use the definitive pane, and they couldn't have their machinery gummed up with stamps which should be on the covers. The first panes we received had a single hanger in the perforation hole immediately above the elliptical (long) perforation hole. These panes also had the security slits in two types - at the bottom the divided 'paperclip' and at the top, a continuous paper clip. The panes in the books - and later loose panes - are completely different. Both 'paperclips' are divided, but more significant are the three additional hangers (see type B to the right of the illustration). 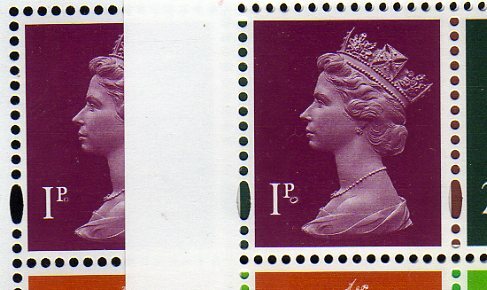 An additional hanger is in the 5th hole from the top on the long sides of the stamp, and two more are on both the short sides, five holes in from either corner, making 8 hangers in all. 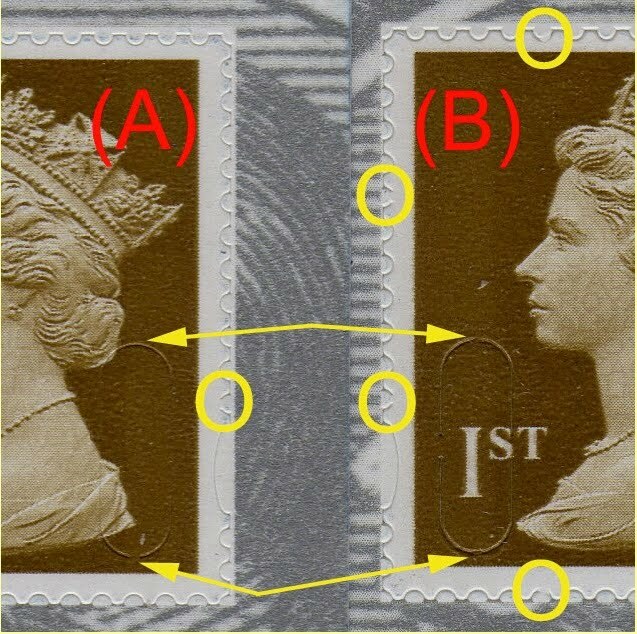 These differences apply to all three stamps, so if you are a specialist collector for this sort of detail there are 6 new stamps, not 3. So - a deliberate change because either the printer had problems preparing the books or Royal Mail had problems with the handling & FDCs for this pane, or just a minor variation. 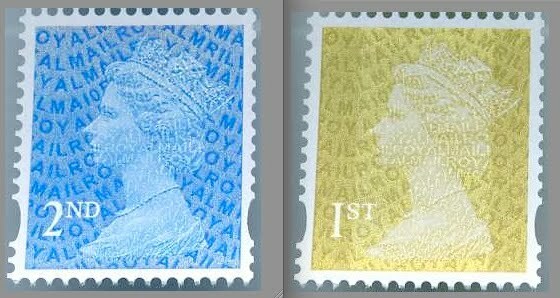 Or is it, perhaps, something that Royal Mail's production department have introduced to make Machin collectors even more interested, something to get you keenly examining every copy of every new stamp to find out whether there are unannounced differences ? I'd be interested in any further variations to this pane either in the hangers or the paperclips. We can't spot everything - most of you know that I am not so much a Machin specialist, but more conduit for all the news that we and others find! The Large Letter stamps with MA10 code have the point of origin code changed - see the now edited original post and comments. Visitors are probably aware that Royal Mail will have two Smilers photobooths at the show (like the 1 they have at Stampex). You should be warned that there is no facility to use digital images on flashdrives etc. 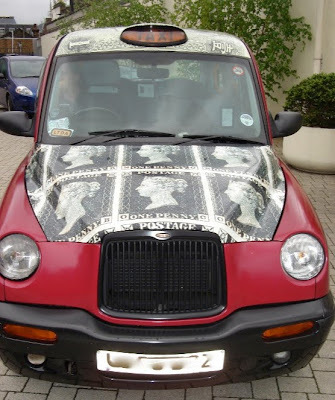 The system is set up only to take images from the camera - although it is possible that a photograph could be placed before the camera and used for personalisation of these sheets. Dealers and collectors have been discussing at length which would be the next Machin stamps to show the new MA10 year code. And we found out sooner than expected. Not only did we find new stamps, but also found that they had been packed in 2009! The 1st class and 2nd class Large booklets of 4 are now available with code MA10 to the left of the eye (adjusted in Photoshop Elements). 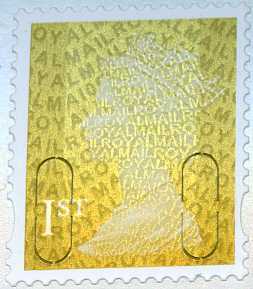 As you can see the FOYAL has been replaced with ROYAL in the 2010 stamps, and the line below it now incorporates the origin code, MAIL now reading MFIL. Both booklets have been printed with W1 cylinders - base colour, phosphor and overlay. The packing caption shows that the 2nd class booklets were packed in February, but the 1st class booklets were packed in December 2009! 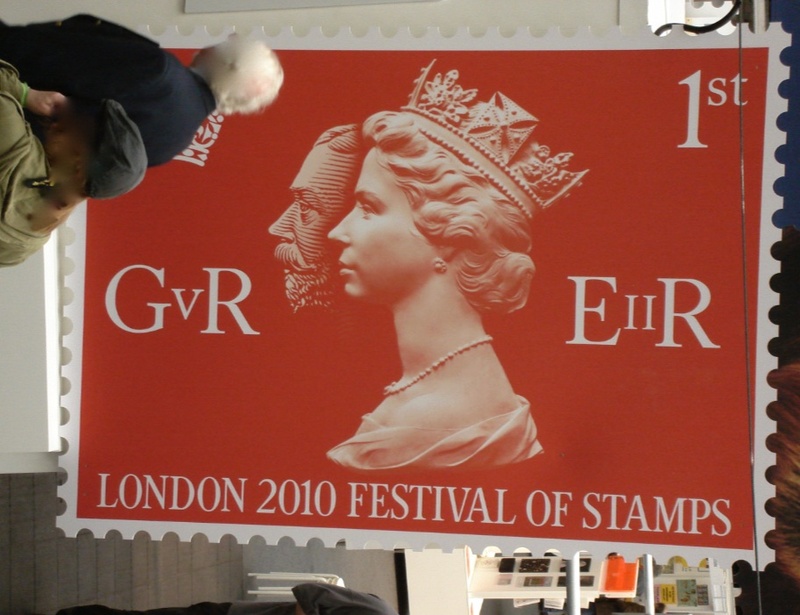 The key here is the difference between Royal Mail and Post Office (Counters Ltd). 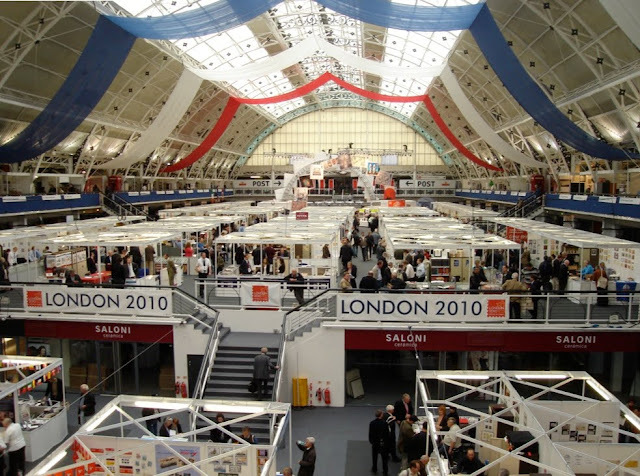 Royal Mail were always going to have a big stand selling all their philatelic products as part of their support for the international exhibition and festival. 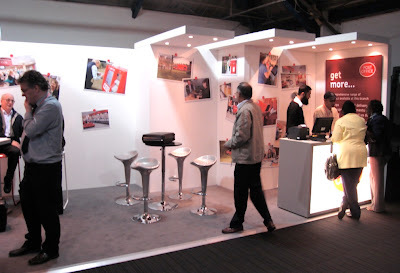 The presence of Post Office Ltd was by no means certain. For Stamp World 1990 at Alexandra Palace there was a Mobile Post Office trailer in the car park. I can't remember a presence at StampShow 2000, although there probably was one. 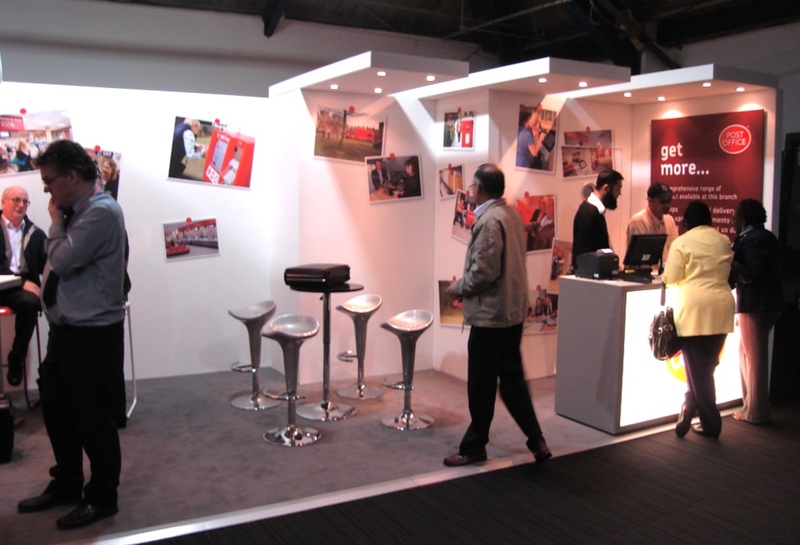 But as recently as late February Post Office Ltd couldn't tell us whether they would have counter facilities or even Post & Go machines at London 2010. It does seem that the arrangements were made quite late in the process, but we did indeed have a Post Office presence, albeit in some fits and starts! At the left, off shot, the Post & Go Machine. At the right, the counter with scales, horizon desk and printer. Not full facilities, but certainly I was able to draw cash from my bank account (avoiding a trip across the road to Barclays' ATM), stamps could be bought, letters and cards posted. And, of course, the Horizon machine could produce the much-derided white label - but these labels were not white - Islington joined Wales in having the golden Machin labels! Some first day covers have been prepared, and some letters sent through the ordinary mail. 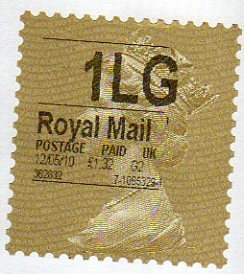 It will be interesting to see if there are any problems with the time-limited Post & Go labels which, issued on 8 May, had to be posted by 9 May. But there are no collections on 9 May, so the ones I posted this morning will be picked up on 10th May! Examples of actually posted, and first day, envelopes will be added when received. 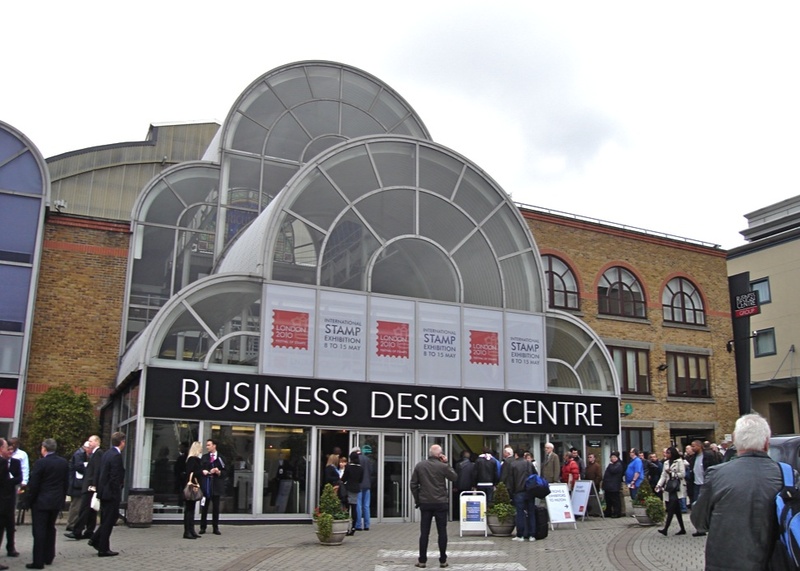 Had an enjoyable trip to London yesterday and the Festival of Stamps and the Business Design Centre in Islington. Lots of news, but first a gallery of first impressions. 09.30 Ticket Holders starting to enter the building. 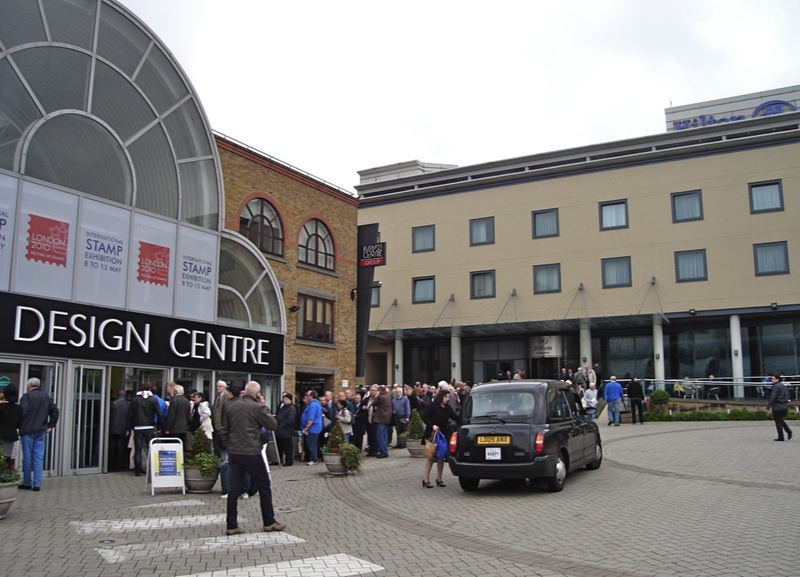 The queue extended round the corner and alongside the Hilton Hotel. Auction House Spinks advertise on a London cab - it's a long-term arrangement but the driver now appreciated why he was parked up outside the Hilton! 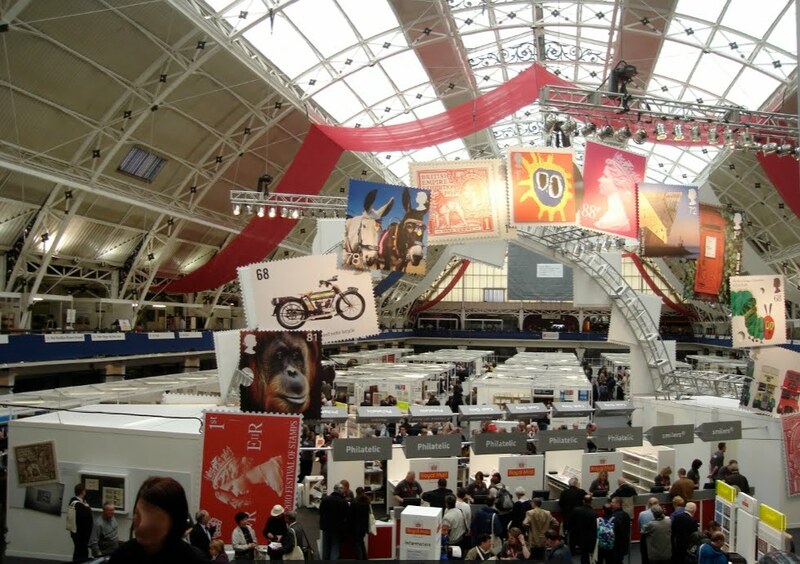 10.15 After a breakfast break at the conveniently placed and friendly Cafe Uno, our first view of the main hall, with Royal Mail's stand in the far distance. 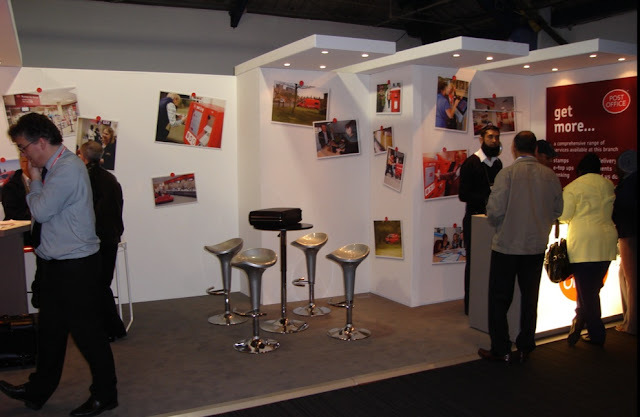 Royal Mail's huge stand with many serving points which kept queues quite short. And lastly - discovered mid-morning by some and not until the afternoon by others! The Post Office counter, with malfunctioning Post & Go machine off-screen at the left.